I will be teaching a 5-session workshop at Arlington Center for the Arts, once a week from January 18 to February 15, from 3 to 4:30. 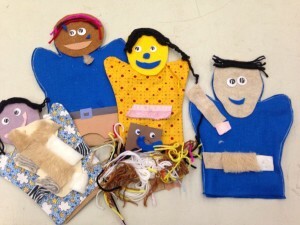 We will create puppet characters — with felt, socks, paper plates and fabric — and have a lot of fun teaching them to walk, run, dance, fly, talk and sing. Each class will include time to explore and play with puppets and props. I hope your 5 to 8-year old will join me! Meet the Fairies at Fairyland Pond!